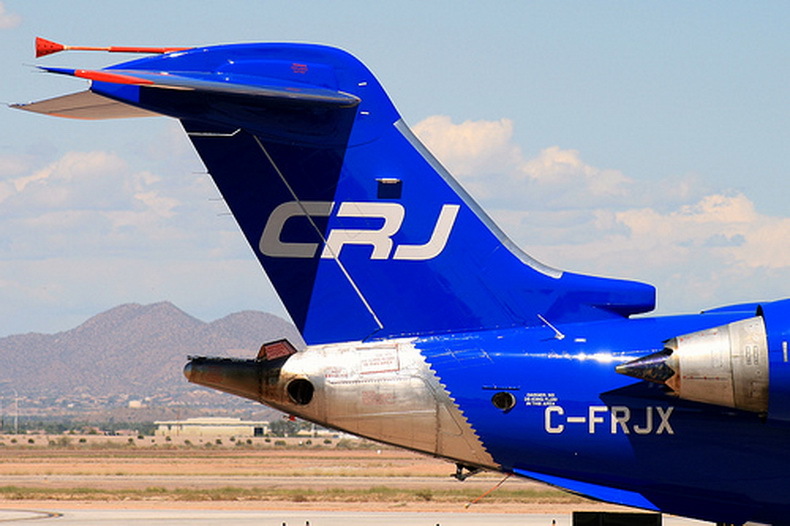 The aircraft is the latest in the CRJ regional jet series. 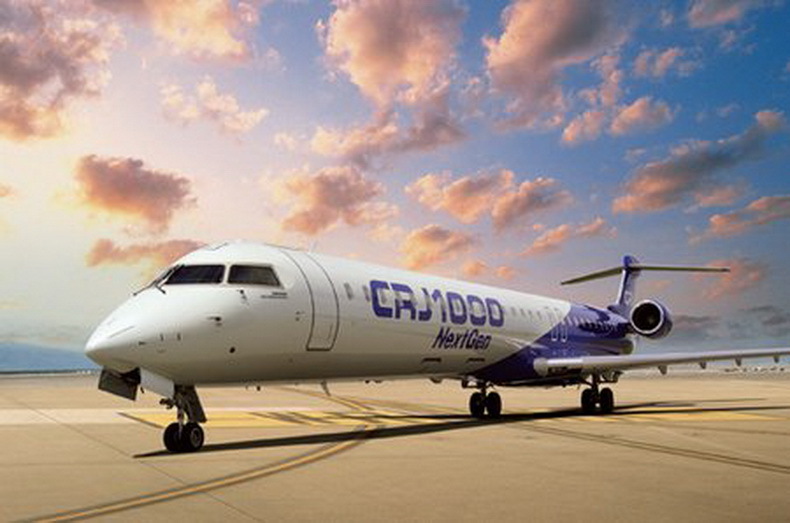 A total of 1,665 of the Bombardier CRJ series regional jets have been ordered, of which 1,498 have been delivered. The CRJ1000 is offered as a new build or as a conversion from the CRJ900. On 19 February 2007, Bombardier launched the development of the CRJ1000, previously designated CRJ900X, as a stretched CRJ900, with up to 100 seats. Bombardier claims that it offers better performance and a higher profit per seat than the competing Embraer E-190. 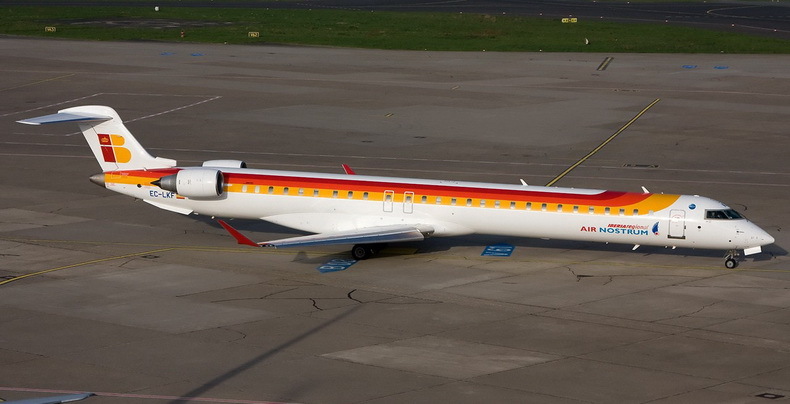 Brit Air and Air Nostrum are the launch customers for the CRJ1000. 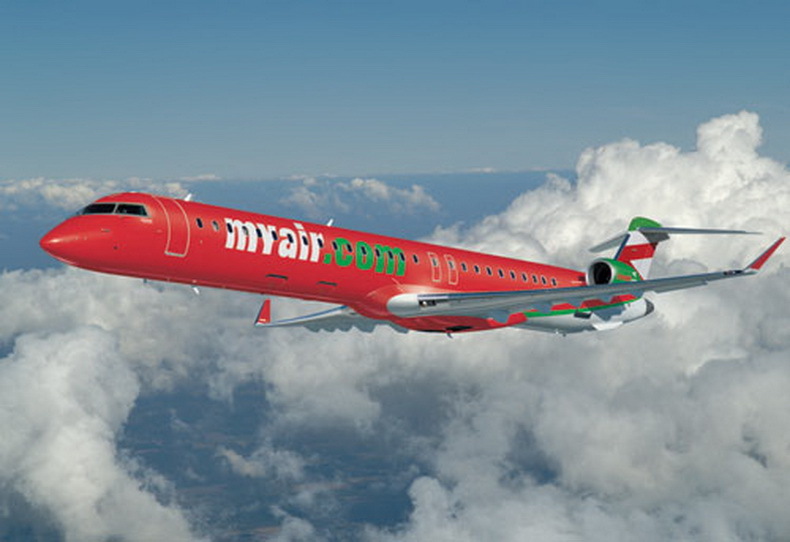 MyAir had ordered 15 CRJ900Xs that were converted to the CRJ1000, but the airline went bankrupt on 24 July 2009. Atlasjet also indicated interest in the new type. The CRJ1000 successfully completed its first flight in 2008. Bombardier, however, stated that the introduction into service had been delayed until the first quarter of 2010. On 14 June 2009 Bombardier announced a new firm order for 15 CRJ1000 NextGen aircraft placed by Air Nostrum, for a total of 35 CRJ1000 NextGen aircraft. There are 49 firm orders and 4 options for the variant as of August 2009. The variant completed its first production flight on 28 July 2009 in Montreal; the entry into service was planned then for the first quarter of 2010. A month after the first flight, however, a fault in the rudder controls forced the flight-test program to be grounded. The program was not resumed until February 2010, and deliveries were projected to begin by January 2011. 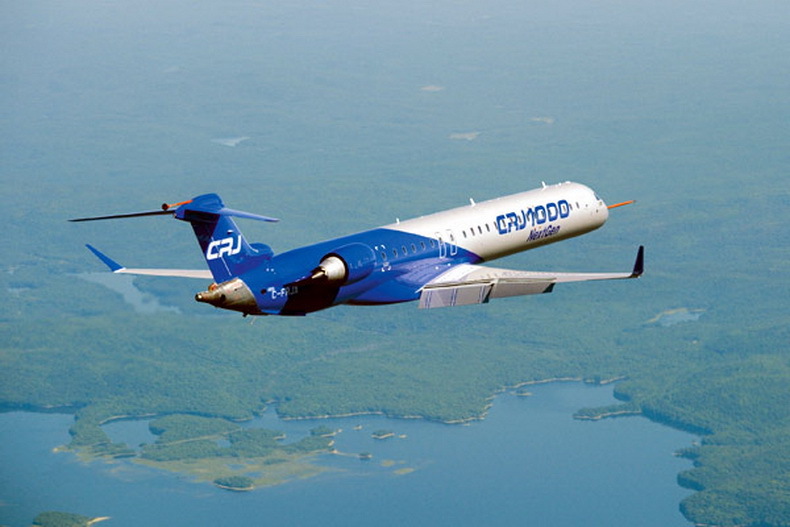 Bombardier Aerospace announced on 10 November 2010 that its 100-seat CRJ1000 was awarded Aircraft Type Certificates from Transport Canada and European Aviation Safety Agency, clearing the way for deliveries to begin. On 14 December 2010, Bombardier began CRJ1000 deliveries to Brit Air and Air Nostrum. On 23 December 2010 it was announced that the Federal Aviation Administration had also awarded a type certificate, allowing the CRJ1000 to operate in US airspace. The FAA Type Certificate designation of the CRJ1000 is the CL-600-2E25. In February 2012, Garuda Indonesia airline ordered six CRJ1000s and took options for another 18, and Danish lessor Nordic Aviation Capital ordered 12 for Garuda to operate with delivery beginning in 2012. The aircraft will be built in two versions, a standard and an extended-range (ER) version. 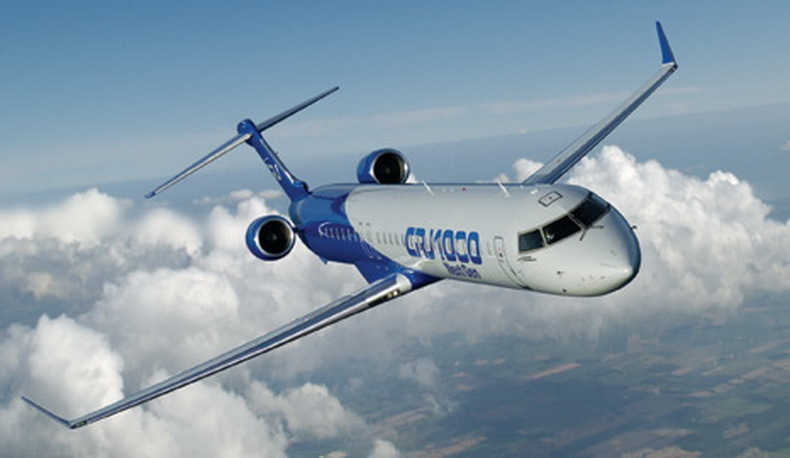 Carrying 100 passengers, the CRJ1000 has a range of 2,760km and the CRJ1000ER extended range has a range of 3,130km. The CRJ1000 regional airliner is being marketed to meet the needs of growing regional airlines for jets of up to 100 seats, with environmentally green performance and with particular focus on low operating costs, greater fuel efficiency and improvements in passenger comfort. In comparison to older aircraft of similar passenger capacity currently in operation, the CRJ1000 provides substantially lower fuel consumption and achieves up to 30% reduced carbon dioxide engine emissions. The CRJ1000 has a wingspan of 26.17m and incorporates a redesigned wing-tip, winglets and an optimised wing leading edge, in order to provide a lower lift-to-drag ratio and allow reduced approach speeds. The fuselage is of semi-monocoque design. The overall length is 39.15m. 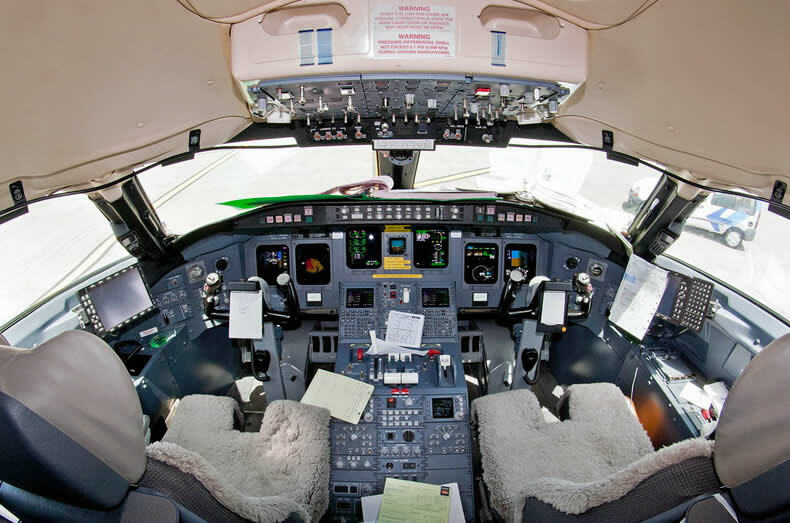 The CRJ1000 has the same two-pilot flight deck configuration as the CRJ900. The flight deck is equipped with a Rockwell Collins Pro Line 4 integrated avionics system, with a six-tube electronic flight and information system (EFIS) and engine indication and crew alerting system (EICAS). The instrument panel has six 127mm×178mm (5in×7in) cathode ray tube displays. The avionics suite also includes a Flight Dynamics HGS 2000 head-up guidance system, Rockwell Collins automatic heading reference system (AHRS), terrain collision avoidance system (TCAS) and Rockwell Collins digital weather radar. The integrated avionics processor integrates the autopilot and flight management systems. The windscreen and cockpit side windows are fitted with electric de-icing systems. The main cabin, with interior design by C&D Interiors, is 27.6m in length, about 101m³ in volume and can seat up to between 100 and 104 passengers. 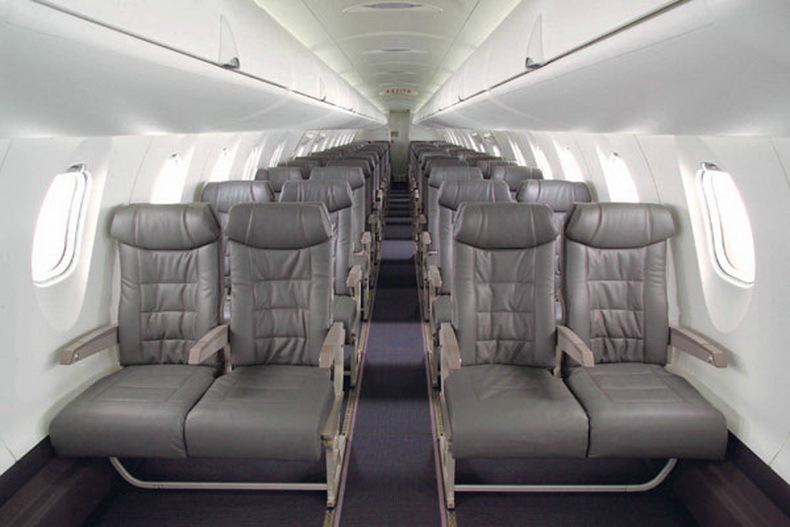 Standard seating is for 100 passengers in a four-abreast configuration. Other interior layouts include two-class interiors with mixed seat pitch. The aircraft's lighting is supplied by Hella Aerospace GmbH. The cabins are air-conditioned with a Liebherr air management system. Garuda Indonesia took delivery of the first of six Bombardier CRJ1000 NextGen regional jets ordered by the aircraft's launch customer in the Asia-Pacific region. The Indonesian flag carrier is also to operate 12 additional CRJ1000 NextGen aircraft through its lease with Nordic Aviation Capital and holds options on 18 more aircraft of the same type.